Famous Tamil poet Kamban in his epic work Kamba Ramayana explodes several Dravidian myths; Dravidian politicians and half- baked Dravidian ‘scholars’ are fooling the Tamil community for long by projecting the womaniser Ravana as a Dravidian. They say Aryan Rama killed Dravidian Ravana; They even celebrate Ravana Jayanti on Rama Navami day or Desersa Festival. But according to the famous poet Kamban, who wrote Ramayana in Tamil, Ravana was a Brahmin! My mum wants Rama’s Skull for Tarpana! Against who killed my father (Karan)? In the skull of the one who killed him! Wedding string= Mangala sutra, Thaali in Tamil. The message is clear: Demons also do Tarpana and Tithi to the departed soul. So Karan’s wife was waiting to do using Rama’s skull as a vessel! In another place, when Vibhishana asked his brother Kumbakarna to come to Rama’s side, he refused to join Rama’s army because he did eat Ravana’s food all through his life and he did not want to see Ravana dying before his eyes. He added, “My dear brother Vibhishana! You continue to be in Rama’s side, so that you can do Tarpana (water offering to departed soul) to all your brothers including me”. So they all believed in the funeral tites like other Hindus. To avenge your long-standing grievance? Here also Rama appreciates son’s duty to demon Khara. “Such is the strength of these men. Ravana is Brahma’s grandson, thus emphasizing that he is a Brahmana. This is confirmed in several Tamil sthala puranas, where Rama was said to have got rid of his sins of killing Brahmins (Ravana and his son’s). Ravana and his son Indrajit got all the powers from Hindu gods through penance! They all did water obsequies to the departed souls like any other Hindu. All these explode the Dravidian propaganda about Ravana. Kamban lived 1000 years before our time. What Kamban said was already said by Valmiki and others. This is about Ravana’s brother Vibhishana. Any one reading Kamba Ramayana or other scriptures will find umpteen references to Ravana and his brothers as Brahmins. Then how come they are called demons? They did not follow a disciplined life and more over violated all the rules laid for Brahmins. They got all the benefits and powers of penance, but abused them! Even today we see people who abuse religious powers even when they are at the top posts. Ramayana in the Arts of Asia is a wonderful book with lot of information with particular reference to South East Asia. Author Garrett Kam is a scholar in the art history. I have found some useful information and pictures which I have never seen in any other book on Ramayana. Ramayana character names change in all languages This is very useful for researchers. With is as a guide we can figure out the names of Hindu Gods in different countries. The pictures from private collections and museums are not available in other books. The display of important points in boxes is very attractive. I am just reproducing some pages which shows the Ramayana names in different cultures. Please enlarge the pages and read. Nagapasa binds Rama and Lakshmana. Everyone must buy this Encyclopaedia on Ramayana. RAMAYANA sculptures in Cambodia are well known; but sculptures describing the scenes of Ramayana in Thailand are not known to many. Some of the sculptures were even interpreted earlier as scenes from Buddha Jataka stories. Now we know they are from Ramayana. Mostly sculptures of Hindu gods are found in the temples of Prasat Phnom Rung and Prasat Phimai. Other sculptures of Hindu Gods are kept in Bangkok Museum. makes highly agreeable and logically acceptable timeline of our civilization. (Ramayana) I had concluded that it was the full moon day of either the month of Margasirsh (Maarkazi in Tamil) or Paush (Thai in Tamil)of the last year of exile (5076 BCE). However, I had no means to verify whether a lunar eclipse had actually occurred about 7000 years or not. My belief and understanding was that the software I was using did not have the capability of showing the occurrence of lunar eclipse. I browsed the web for any other software. These efforts bore no fruit. For almost five years I had desperately wished and prayed that somehow I could verify and demonstrate the occurrence of Lunar eclipse so that my findings become complete in all respects. Since no solution could be found to this puzzle and being completely helpless in this regard, I submitted my manuscript to the publishers for publication in the month of October 2003. (He just mentioned that he could not verify the lunar eclipse in the manuscript). After a few days, I read in the newspapers that a lunar eclipse was to occur on the morning of 9 November 2003 and it would be visible from India. Late in the evening of 8th, without any specific hope of finding a solution, intuitively I felt like examining the position of the sun and the moon during the eclipse due to occur the next day, though the software. My intention was to compare the positions of the sun and the moon during the eclipse of 9 th. However as soon as I entered the time of the occurrence of the eclipse in the software I was surprised to find that the software was displaying the occurrence of the eclipse very precisely. Without wasting a moment, I entered the date 12 September 5076 BCE. (full moon day of lunar month Margasirsh, which according to me the day Hanuman visited Lanka. This shows the author’s long and sincere research into the date of Ramayana. Thailand has got lot of Hindu sculptures from Ganesh to Kubera. Vedic gods Indra, Yama, Vishnu, Shiva and Brahma are also found in different places. Ramayana scenes are in the panels in many temples. We see them more from the Khmer period. It is from the Lobpuri period Rama story begins to appear. It was the period when Khmer influence spread from Cambodia. During the Lobpuri period small figures of bronze Hanuman idols used as standards on top of wooden poles. Since the Burmese burnt down the libraries, temples etc. in 1767, a lot of sculptures were destroyed in Ayuththaya (Ayodhya) period. In the Thonburi and Bangkok periods kings themselves were great scholars , we have very good paintings in the temple of Emerald Buddha- Wat Phra Keao. The bas reliefs as many as 152 in number, found in Wat Phra Jetubon, the funerary temple of the present ruling dynasty, depicts the central episodes of the Ramayana story. The mural paintings in the Vihara of Wat Nang Phya in Phitsnulok in Nothern Thailand and the 152 marble panels give the complete story of Ramayana. Apart from these there are wooden panels depicting scenes from Ramayana. Wat Po Vihara also has some Ramayana sculptures. The significance of these Thai sculptures is showing the unknown characters of original Valmiki Ramayana. In the second part, I will give the details of the sculptures of other Hindu gods. 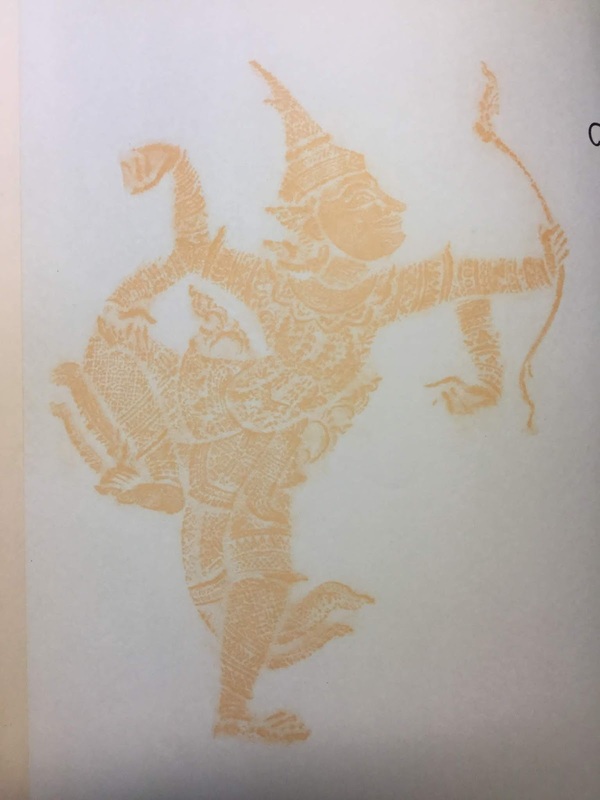 Thai Ramayana ‘Ramakien’ differs with Valmiki Ramayana in the birth story of Kusa and Lava. They were the twin sons of Rama and Sita according to Valamiki. But ‘Ramakien’ of Thailand and Ananda Ramayana of India differ very much. It is an interesting animal story. A son was born to Sita and he was named Mongkut. But her second son was created by a miracle by sage Vajmrga (Valmiki). One day Sita went into the forest to gather fruits after leaving her son Mongkut with the sage. She was enjoying nature and saw a family of monkeys. She told the monkey mothers to be careful with their babies otherwise they may fall from the trees. Monkey mothers laughed at her and said to her that they were better than Sita who left her child with the sage who closed his eyes for meditation. Sita was shocked to hear this and rushed back to the sage’s ashram and brought back her child. In the meantime, sage opened his eyes after meditation and found the child was missing. Thinking that Sita would feel sad, he created another child by miracle. When Sita came back he explained what happened and advised her that the second son will be the playmate of her first son. He gave it the name Lava. It is in the Janmakanda section (Canto 4, verses 21-86). Sita had only one son and he was named Kusa because sage Valmii sprinkled holy water on the baby with Kusa grass. Rama came by Pushpaka Vimana (aeroplane) and did the birth rites with some brahmins and went back to Ayodhya by the Vimana. He told them not to reveal the news to anyone. Sita’s father Janaka also came but he stayed even after Rama left. One day she went to the river to take bath and saw a monkey mother with five baby monkeys. She left her baby with the sage Valmiki. When she saw the mother monkey carrying five of its litter, she felt very guilty for not taking her baby. Sita rushed back to the hermitage of Valmiki and took her baby. At that time, Valmiki with his disciples went to the riverside. When Valmiki came back to his hermitage, he was surprised to see Sita’s son missing. So he created a double of her first son. He gave the second son to Sita and named him Lava, because he was created with Lava/wool. Both the children grew up together at the hermitage and their parents showered love and affection on them. Kathasarit sagara, slightly differed from this version and said Lava was her first son and Kusa was the second son who was created by Valmiki’s miraculous power. One can understand the deep impact of Ramayana on a vast geographical area and long span of time. Valmiki’s original version was distorted here and there in course of 2000 or 3000 years. Ramayana is in Buddhist and Jain literature as well. Hindus never like one woman staying with another man who is not her brother or father. So there are lot of stories about the infidelity of Sita. In Thai Ramayana Adul, a demoness daughter of Surpanakha wanted to take revenge upon Rama, because his brother Lakshmana cut off Surpankaha’s nose. Adul was working as a servant maid in the palace of Rama under a different disguise. She asked Sita to draw the figure of Ravana and when she drew the picture out of fun, Rama saw that. The demoness used that opportunity to betray Sita and Rama wanted to kill his wife Sita. He assigned the task of killing Sita deep inside the forest to Lakshmana. And Lakshmana took her to the jungle, but his mind didn’t allow him to commit the ghostly act. So he showed her the hermitage of Valmiki and took back the heart of a deer and showed it to Rama as a proof of killing Sita. Rama came to know that Sita was alive after a very long time. In the original Ramayana of Valmiki she was simply banished from the country because a washer man suspected her chastity. Ramayana is the only epic in the world which has penetrated the deepest parts on earth in the oldest time. Even tribal communities have different versions of Ramayana episodes in their folk songs. That shows Ramayana might have happened several thousand years ago. The folk song in the tribal Bundelghund region says when Sita visited the forest she drew a portrait of Ravana at the behest of her friends. They insisted her to draw the figure to see How Ravana looked like. This happened long after the death of Ravana and Sita’s joining her husband. Sita did it with the cowdung. As she was making the figure up to waist, there appeared Rama and suspected Sita’s fidelity. Then he ordered her expulsion. There are over 3000 versions or more of Ramayana. Every time I go to British Library in London, I see a new Ramayana episode or many episodes in very old Tamil Books. In 2000 year old Sangam Tamil literature there are two episodes which are not found anywhere else in the world. In the Alvar/ Tamil Vaishnavite saints’ poems we see new episodes about squirrels helping in the bridge work. In the Pali and Prakirit language literature we see newer versions. The most attractive story of Rama and Sita stand for the purest qualities and virtues on earth. No other literature of the ancient world has made such an impact anywhere on earth. After the founding of ISKCON and other organisations, story of Rama and Krishna and the Mantra ‘Hare Rama’ have been echoing in the nook and corner of the world. Please read also my articles on Vivekananda’s lecture on Sita and Sangam literature poems on Rama and Sita.